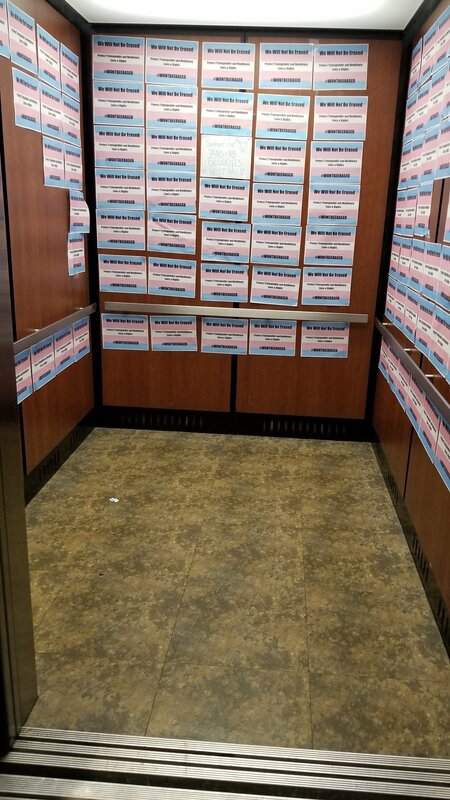 Elevator in West Hall covered with Trans support posters. Photo by Cheyenne Roper. A posting related to support of transgender and non-binary lives was repeatedly ripped down and eventually torn in the West Hall dormitories on Monday, October 28. An email was then sent to the resident students of West Hall on November 2, notifying them of the details of the incident. Hernandez also mentioned the importance of providing respect for all residential community members and how the destruction of signs or posters concerning an organization or club is irreverent. “When postings are defaced, vandalized, or torn down either by members of our community or guests for whom we take responsibility, it diminishes the respect we demonstrate for one another and erodes the sense of trust we hope you build within your residence hall community,” continued Hernandez. Sarah Meaney, director of Housing and Residence Life, added how bigotry is not accepted or tolerated on campus. EC will be participating in a Trans Day of Remembrance, a day to memorialize and honor trans people around the world whose lives have been lost to anti-transgender violence, on Tuesday, November 20. A candlelight vigil will be held at 7:30 at the fountain outside of A.C. Buehler Library. Taylor Lutz, a member of Queer Straight Alliance (QSA) who also lives in West Hall, says that QSA is willing to meet with anyone to discuss these issues. Lutz also added how QSA hopes for peace. “QSA hopes that in the future, we’re given the same respect as everyone else and allowed to exist in peace, without fear of being targeted or harassed,” concluded Lutz.